Alleviating the slippery feel inherent to most sleeping pads, the Eureka Green River Air Pad features Stealth-Grip fabric for a soft, slip-free connection with your body. Horizontal I-beam construction supports your weight without uncomfortably folding along the sides, leaving you free to stretch out along the pad's entire surface. The integrated raised pillow gives weary heads cushioned rest after a long day of exploring. Another camp-smart feature is the integrated hand pump for quick and easy inflation. Note, its relatively low R-value means it's best suited for camping in warmer conditions. 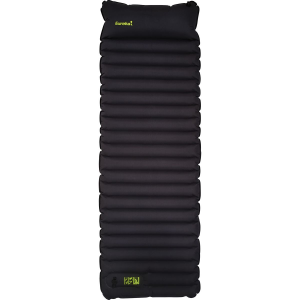 And although this pad works great in any tent, it's part of Eureka's Camp Comfort system, which pairs select sleeping bags and tent floor materials for a sound sleeping experience without slipping.